This article will tell the solution to fix low disk space problem on hard drive when Windows Server reports the low disk space warning message. Download IM-Magic Partition Resizer Server to resize disk partition when it runs out of disk space on Windows Server. Usually, you may receive low disk space alert when system partition is running out of disk space. When Windows Server reports low disk space warning message, you can rely on Server partition software to reallocate disk space. IM-Magic Partition Resizer Server is professional hard disk management software, which can work perfectly with 32 & 64 bit of Windows Server 2003, 2008, 2012 operating system to resize hard disk or RAID 5 disk with all original data untouched. This partition software enables you to extend partition, shrink partition and move partition easily so as to reallocate disk space on Windows Server. Move the arrows to shrink the selected partition and then you can see some unallocated space which shows beside the partition you shrink. You need to move the unallocated space close to the partition which runs on low disk space. 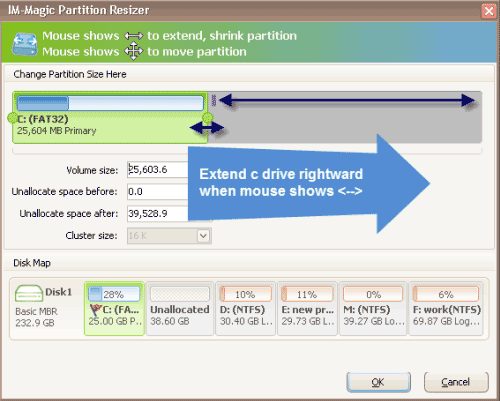 Then, right click this partition and select "Resize/Move" option. Move the arrows to add the unallocated space to the partition you want to extend and then click "Apply" button. "Windows SBS 2003 shows low disk space warning message on C drive when I attempted to install a program on my computer. I found that there is only about 125MB free space on C drive, but the program I want to install has 500MB size. I tried to install the program on D drive which still has lots of free space, but the problem is that the system still reports low disk space warning message when I boot my computer. 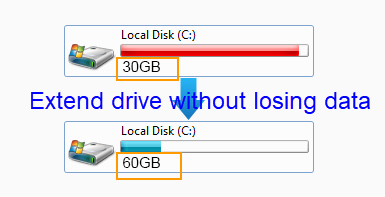 Can you tell me how to solve the low disk space problem on SBS 2003 C drive?" "Windows Server runs on low disk space on system partition, so I am looking for a partition management tool to fix the problem. I want to look for a partition tool which can help me reallocate some free space to system partition without reinstalling system or deleting any data off the partition. Can somebody recommend any useful partition software?" Low disk space is a warning message on Windows PC when hard disk partition is running out of disk space. Usually, Windows system reports low disk space alert message to tell that the partition is nearly full and you need to delete or move some files to free up disk space on the partition. Sometimes, you can ignore the message, but the problem might not be so simple when the system shows low disk space warning message on system partition because the system partition low disk space problem might have influence on the performance of your computer. When Windows Server reports low disk space on system partition, the best way to solve the problem is to increase the size of the partition rather than deleting or moving any data. With help of partition software, you can redistribute hard disk and reallocate disk space without repartitioning hard disk or reinstalling system. IM-Magic Partition Resizer Server, as professional partition software, allows you to move free space from one partition to another so that you can increase the size of system partition effectively and efficiently. It is much easier to resolve the problem if is data volume runs out of disk space because you can easily move some data to another partition or storage media to free up disk space. If you do not want to move any data, you can also use the partition software to resize the partition. Usually, you can increase a data volume by moving free space from another data volume on the same hard disk, and you can also move free space from a system partition to extend a data volume. If you encounter low disk space warning on RAID 5, you can also use IM-Magic Partition Resizer Server. This partition software works perfectly on hardware RAID 5 too to help resize partition when it is running out of disk space. You do not need to rebuild array or move any data in order to resize RAID 5 on Windows Server.